Two private waste management firms manage the waste in three regions of the town, the Northern, Central and Southern region respectively. The firms as per the mandate have to cover all their respective areas thrice a week. The firms have to also carry out door to door waste collection and segregation of dry and wet waste on a regular basis. Although managing waste has improved over the years, people say there is still a lot that needs to be done. One of the main concerns raised by the people is waste collection’s timing and schedule. They said the providers of waste collection services were are not able to maintain timetable. “I own a restaurant and it is a problem for us to keep wet waste inside for long. It starts to rot and produce a foul smell. For dry waste, it is not much of a problem. In my area, the garbage truck comes on Sunday, but sometimes they come in the morning and sometimes in the evening. We get confused and miss the chance to dispose of our waste,” Tshering Yangchen, a resident in Taba, said. “I reside at Kalabazar and the situation is worst there. Sometimes the waste trucks don’t turn up for a month. As a result, the area is filled with waste everywhere. It is a problem for office goers to dump their waste with their timing. I feel they should at least come 3 times a week and have fixed timing,” Preti Maya Limbu said. On the other hand, the private waste management firms say they do everything within their capacity to provide efficient service to the people. They acknowledge some lapses and are willing to improve the service with proper consultation with the people. However, they say it would not be possible to fulfil each individual’s demand and people must also be responsible for their waste. “If people could call us up we can work on coordinating an appropriate timing with our drivers. When we receive complaints from the public we try to address it immediately. Rather than disposing of their waste everywhere they can always come to our drop off points. We have it near RAPA hall, near Kelki School and for southern parts in the greener ways stations,” Jyoti Gurung, the Proprietor of Clean City, said. 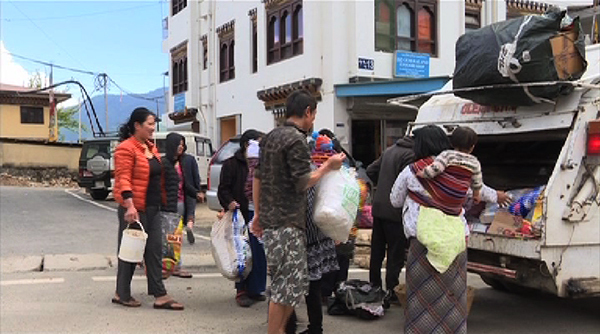 According to the Thimphu Thromde, the waste management was outsourced mainly to reduce government budget to encourage youth to take up waste management and to improve service efficiency. To improve waste management in the capital, the Thimphu Thromde has proposed to buy 25 new waste trucks. They are also working on decentralization of the public waste soon. Also, the Thromde is developing a mobile app to improve the communication between the waste management firms and the public.